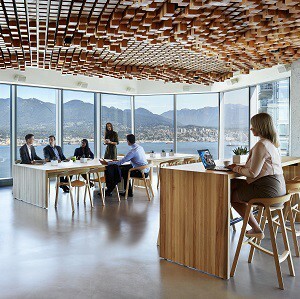 CBRE’s Vancouver office has become the first space of its size to receive gold certification from the International WELL Building Institute in Canada for new and existing interiors. The office occupies 28,000 square feet of Oxford Properties’ 35-storey, LEED certified MNP Tower. As the first space in Vancouver to be certified by WELL, and the fourth of CBRE’s Canadian offices to be so, it’s another milestone in CBRE’s ongoing commitment to adopt the standard across the country. Since launching its new office at 1021 West Hastings Street in downtown Vancouver, CBRE Vancouver has dropped its employee turnover rate by a third and has doubled its new hires, the company says. There was already a focus on healthy employees before the office was certified, and CBRE is hopeful with the official certification the retention trend will continue. “With the war on talent being about recruitment and retention of existing talent, companies are looking for ways to differentiate themselves,” said Ashley O’Neill, CBRE Canada’s vice-president of corporate strategy. “How can they present their values in a way where employees would actually like to spend a decent amount of time at that office? LEED certification has been tremendously successful and it is now the norm. CBRE Canada provides an extensive array of real estate services from 24 offices coast-to-coast. Its 1,800 employees are involved in asset management, brokerage services, corporate services, valuation and appraisal, mortgage and financial services, research, consulting and more. Internationally, the company manages more than 1.7 billion square feet of building space. CBRE occupies four floors of the MNP Tower, which was completed in 2014. The space incorporates more than 100 wellness features such as universal access to natural light for employees, ergonomic sit-stand desks, technology to reduce background noise and even a lighting system which operates according to people’s circadian rhythms. “There is a sound business case for investing in a workplace that embraces a human-centric approach to office design. The office continues to evolve from simply being a place where your staff congregates to complete their tasks into a powerful tool for attracting and retaining the best talent,” said Loren Bergmann managing director of workplace strategy, Western Canada, at CBRE Canada. WELL certification is awarded after intense testing of occupied buildings to see how they perform in categories relating to air, water, nourishment, light, fitness, comfort and mind. A thorough on-site inspection by the WELL Institute is required of a building’s installations in order to achieve the certification. “They’re actually coming into the space, taking samples of the air and water and testing that in the laboratory,” said O’Neill. “There’s a scientific verification for what we say we are offering our employees. CBRE is responsible for four of the first 10 projects in Canada to register for certification; the Vancouver, Toronto North, Toronto West and Downtown Toronto offices. That makes it the first Canadian firm to achieve the WELL standard across multiple locations. While the rest of its 22 offices are not currently certified, CBRE is still finding ways to implement the aspects of the building standard, such as sit-stand workstations within 25 feet of daylight views in all of its new spaces. O’Neill said the company is not afraid to renovate or move into new spaces as leases expire. It is not company policy to do every space in this manner, but CBRE is committed to the the core tenets of WELL. Adoption remains on a case-by-case basis depending on the building and the market, but as CBRE renews leases in its other locations, adhering to the WELL standard will be at the forefront of the firm’s decision-making.